the bmi group's ejector trailers set the standard for durability, longevity, tare weight, serviceability and support, not to mention residual value. Almost 2 years of innovation and design change is what is behind the flagship, bench marked bmi steel ejector trailer. Setting the standard for durability, longevity, tare weight, serviceability and support, not to mention residual value. Available in a range of specifications with an impressive list of options and features to enhance the user experience. The strongest, most durable Ejector trailer on the market. Built with a decade of design experience making the bmi Ejector the premier product for all bulk hauliers. Also available is the bmi Lite, a variant with the same all steel construction, including design utilising lightweight high performance components, but still guaranteeing the robustness of the original design. The revolutionary FastFloor discharges the load in under 3 minutes whilst still retaining full ejector features and push-off at landfills. The FastFloor also takes a payload up to 25 tonnes at a 44 tonne GVW while there is a significant reduction on floor maintenance whilst still maintaining a hardened stell floor capable of handling all waste. 43m3, with Alpha-III rear self loading tailgate. For transport of co-mingled recyclates, domestic refuse, green waste and organic food waste. Reduce the need for vehicles to have to return to depot and tip load by loading to the Mobile Transfer Trailer first. Choice of rear door configurations. Universal. Engine or PTO drive powered. A trailer to transport not only general waste but also dry mix recyclables and organic food waste. 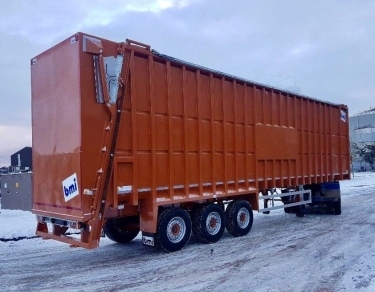 The trailers are entirely leak-proof up to 1300mm above the floor and also have a tank mounted underneath the rear of the trailer to capture any leachate coming from the waste, ensuring that no liquid from the load is escaping and polluting the loading area or the highways. 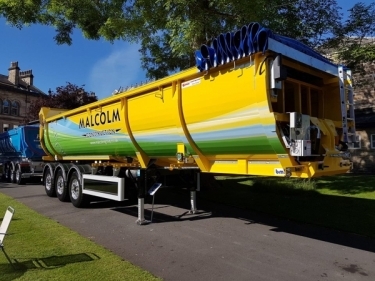 The latest addition to the bmi group's portfolio, the Half Pipe Ejector comes in a variety of specifications, the most popular of which is the Aggregate Spec.